Abstract art is a very broad term for art that distorts the shapes and forms found in reality. An abstract art work can use lines, shapes and brushwork to create an idea of an object, place or person, rather than an accurate visual representation. For many people the term “abstract art” is a bit off-putting because it is hard to know exactly what abstract art is, especially since the idea at the heart of this art is, well, abstract. Abstract art can be found in ancient art works, in the form of tribal designs of animals and the use of patterns to represent elements and places such as squiggly lines for water and triangles for mountains. In the western world, art transformed over the centuries, becoming more and more realistic, until most 15th-18th century artists were producing paintings that hinted at photorealism. Paintings of the Renaissance and the Classical eras were highly realistic with an attention to minute details. In the 19th century, artists began to slowly turn away from the “what” that they were representing in the painting, focusing more on the “how” they felt about the subject or “how” they expressed their idea of the subject. This led to an age of experimentation and innovation – an creative period now referred to as the abstract art movement. Before abstract art became fashionable, artists had tried to hide their brushstrokes within the painting to create a smooth finish. As artists began to experiment with more and more abstract ideas, brushstrokes and even bare parts of the canvas were included as part of the final painting. These techniques may not seem unusual to the modern eye, but to 19th century art lovers, such an abuse of the medium of art was delightful and shocking. The experience for the art viewer changed alongside the changing experiences of the artists, who felt daring and risque, pushing the boundaries of art in ways that had previously been banned by governments and religions. Famous abstract painters include Vincent van Gogh, Pablo Picasso and Jackson Pollock. It’s not surprising that many people are confused by abstract art, as there are so many sub-sects and style groups that make up this art movement. Van Gogh, for example, is classified as a post-impressionist, whereas Picasso is considered a cubist painter and Pollock is now known as an expressionist. All of these art styles make up the much larger art movement known as abstract art. Ironically, tattoo design styles appear to have followed the same path of evolution as fine art. Ancient tattoos were made up of patterns and iconic representations of animal totems or symbols. 19th century tattoos were generally a depiction of a symbol or animal; simple designs that grew in structure and detail to become boldly outlined areas of color. 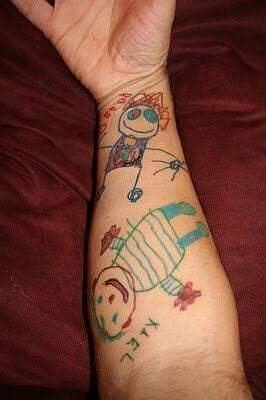 In the past few decades, with the introduction of tattoo equipment such as white inks and better tattoo machines, tattoo artists have been able to create photorealistic tattoos. 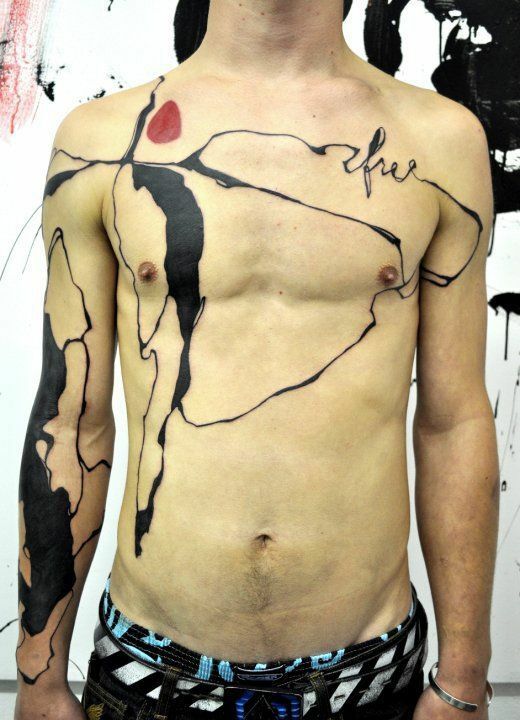 These hyper-realistic tattoos are still popular, but abstract tattoo designs are quickly gaining popularity. 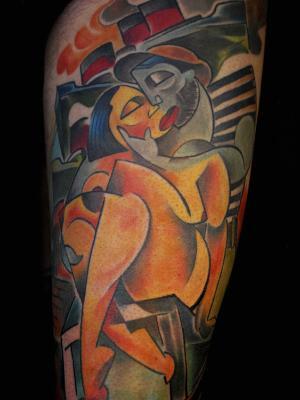 Although the paintings of famous abstract artists are quite popular, there are some abstract tattoo artists who offer complete art works of their own design. 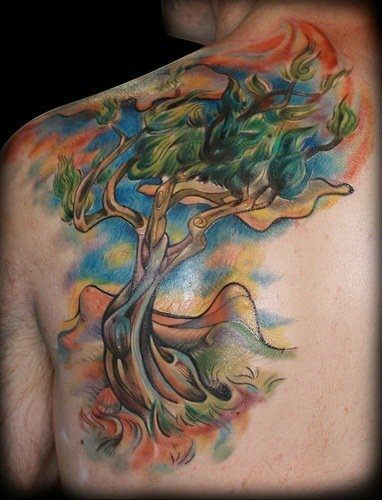 This means that the client gets to wear an original artwork on their body, and the tattoo artist is given the freedom to express themselves through their favorite artistic medium. 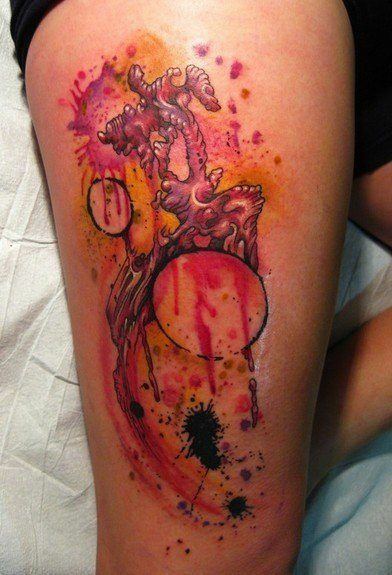 Abstract tattoos don’t necessarily mean tattoos that look like splashes or dribbles of paint. 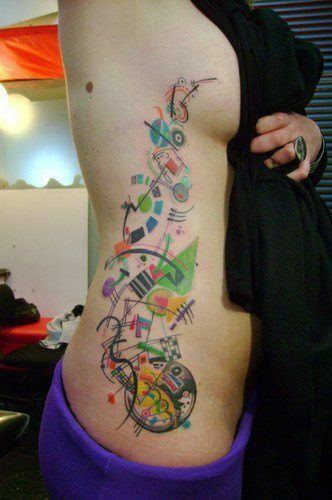 As long as the tattoo design fits into the basic premise of abstract art, it can be classified as an abstract tattoo. 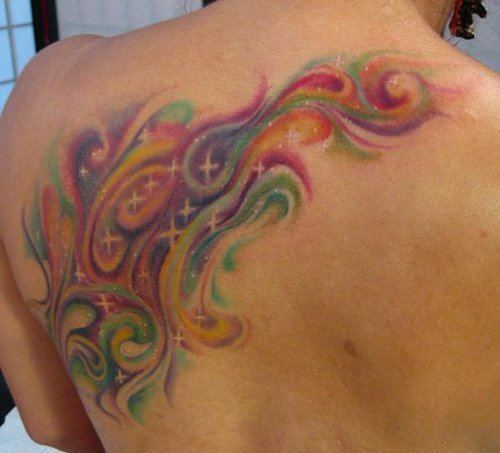 Abstract tattoo designs can be made up of geometric shapes, brushwork and splashes of paint or an unusual use of painting mediums. 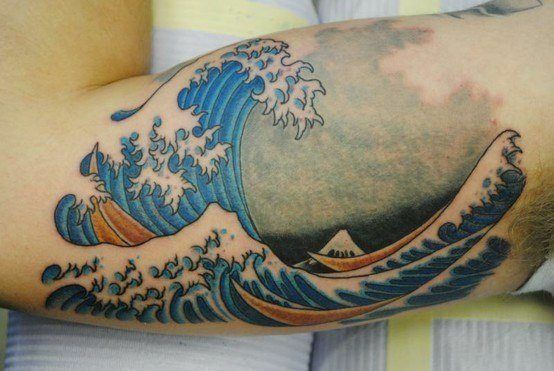 What is the Meaning of Abstract Tattoos? 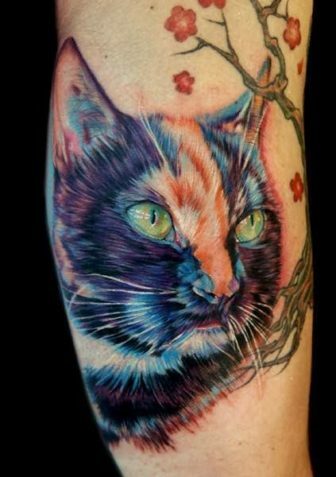 Abstract tattoos can use abstract art styles to represent a symbolic object or animal, which means that the tattoo would contain the symbolism of that subject. To be depicted as an abstraction gives the subject of the tattoo a second meaning – that the person feels detached from the subject, or is unable to fully comprehend it. Abstract art is often made up of shapes and lines. Simple geometric shapes have a lot more meaning than most people are aware of. The circle, for example, is believed to be a representation of eternity and the cyclic nature of life. A single line can represent a space in time or that life is finite (with birth at one end and death at the other). A triangle with its point facing upwards is a symbol of masculinity, while an “upside down” triangle is a chalice shape and a symbol of femininity. What is tricky about the symbolism of geometric shapes is that a single shape can have a vastly different meaning to different people. This is why paintings made up of geometric shapes and patterns often seem to be nonsensical. The viewer’s translation of the “shape language” in the painting might produce a meaning that makes no sense, because the shapes have a different meaning to the viewer than they did to the artist. Color plays an important role in abstract art. The artist uses a combination of form and color to express an idea, and at the heart of every idea is emotion. 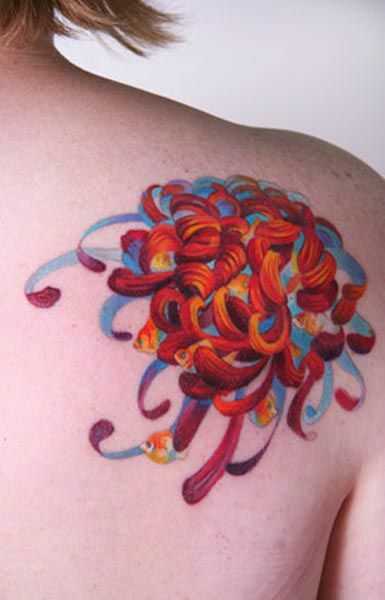 Abstract tattoos can have a meaning to the owner, and an entirely different meaning to someone looking at the tattoo, because each person’s mind will interpret the lines, shapes and colors differently. 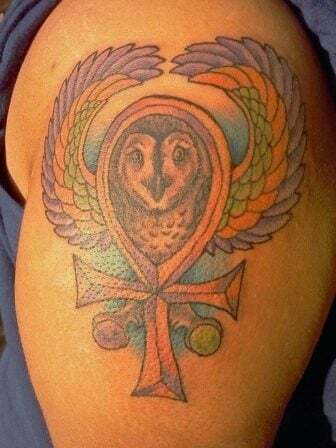 So an abstract tattoo that may seem like a mess to one person may reveal itself in another’s eyes as telling a symbolic story about the tattoo owner’s life.